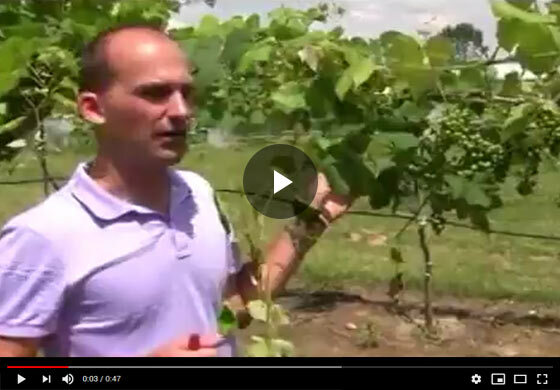 Felix from Gurney's details the essentials of caring for your grape or berry plants. Learn how to thin out the clusters and ensure your fruits are bigger in size, and bountiful. Hi everyone Felix here with Gurney's. today i want to talk to you a little bit about grape care, this in the mid-summer, and I want to talk a little bit about thinning your clusters out. General rule of thumb that I like to use for this is that this here is your cane from last year and you've got a shoot that's originated from that, that's extended on out. And you have, on this particular shoot, you have about five clusters, really tiny one here being your fifth, and you have...one, two, three, for and the little one, so five clusters of grapes. And really, the rule of thumb is that you want one cluster on that shoot. It's a matter of picking out four clusters here. Folks, you really want to do this a little earlier. You want to do this right when the berries are setting, right when you can see your first little berries forming on the cluster. I'm going to leave the one that's second from the base of this shoot, has a little space, good air circulation, so I'm just cutting off the clusters down the way. So we have on this shoot, just have one cluster that it is feeding. All these leaves on this shoot are feeding that cluster. It will give you better sugar development and berry size. Doing this late really is going to do much for berry size. Key to get nice fruit size, big berries, is to do this early, right after the fruit has set. Look for your berry flowers, your grape flowers and when the berries form, the little round miniature berries, that's when you want to actually do your thing.